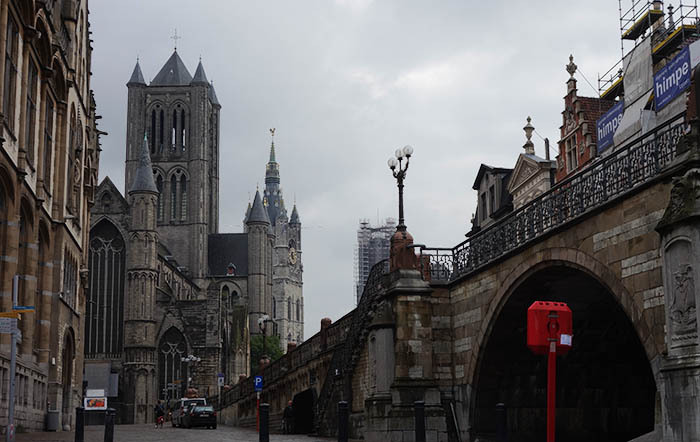 Little did I know that Ghent, sandwiched between bureaucratic Brussels and industrial Antwerp, would be my favorite city in Belgium – and maybe one of the best cities I’ve visited. 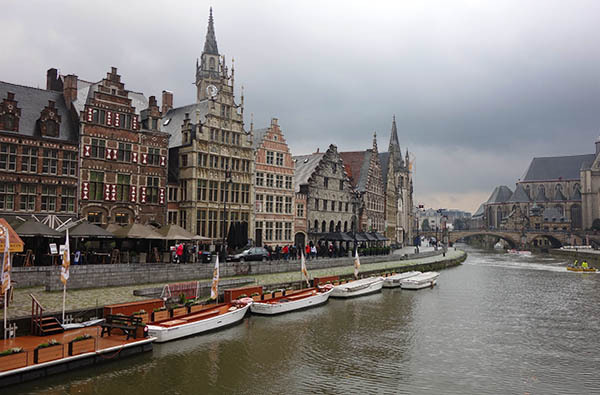 I visited Belgium in part because I absolutely loved In Bruges (both the comedy and the scenery). So I had big expectations for Bruges. But in the end, Ghent was better in every way. 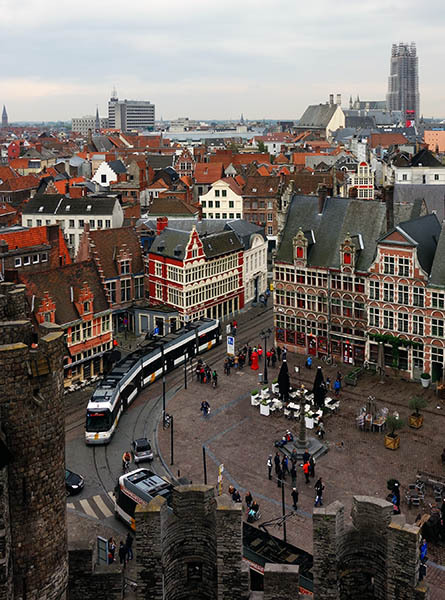 Ghent lies right in the center of the country, a big trading port that was the second-largest Northern European city (after Paris) for much of the middle ages. 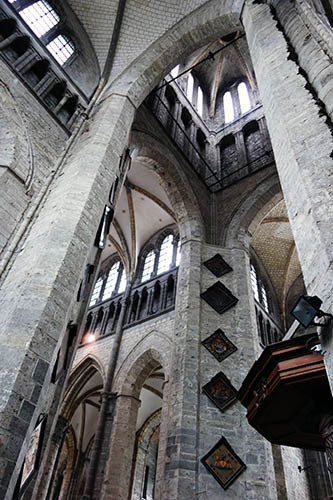 It was also a big brewing city, home of beguinages (monasteries for women), and had a large wool industry. There are two central areas of the city, one the crossroads of a few canals, the other a row of large squares near the two dominant church buildings (Saint Nicholas’ Church and Saint Baavos’ Cathedral). The whole center is stunning, with little windy streets, the largest pedestrian zone in Belgium, canals, castles, chocolates, beer. I took the canal tour, of course, but two years on I remember little except that the guide was funny. I love canal or boat tours of any city I visit. 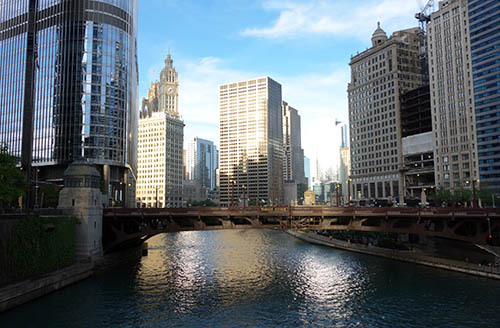 It’s provides a different, lower perspective that meanders to unexpected parts of the city – and it’s relaxing to boot. 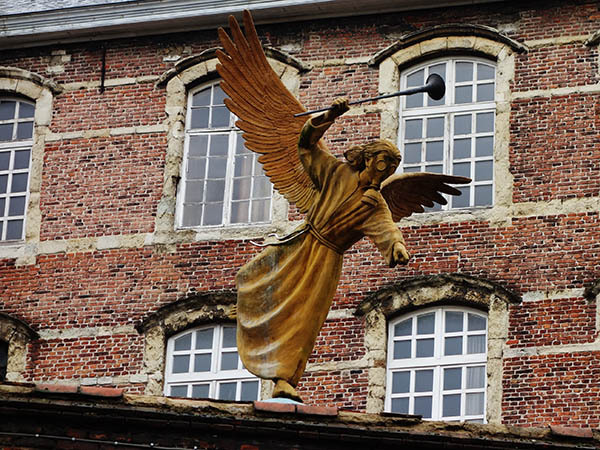 Ghent has a community of local artists, so there were cool local sculptures along the canal, including a totally badass avenging angel. 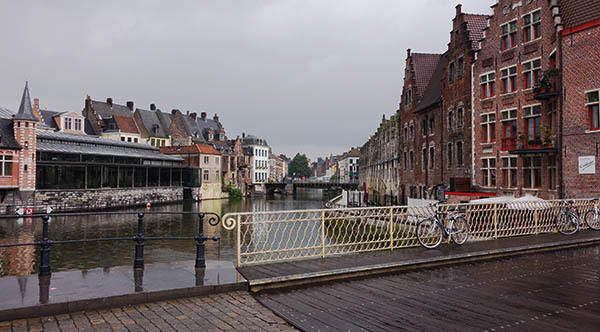 I knew in advance of my trip that scheduling my visit for October was asking for trouble – it’s the rainy season in Belgium. It was a bit of a bummer, but on the other hand there were few other tourists and I knew that I wanted the most authentic experience possible later, when I visited the World War One battlefields. The only downside is that grey skies can make for some boring pictures. One of the big highlights of the city – at least, one of the things that you can’t avoid when you visit – is the castle that looms over the canal, and which presides over the northwest part of the city. 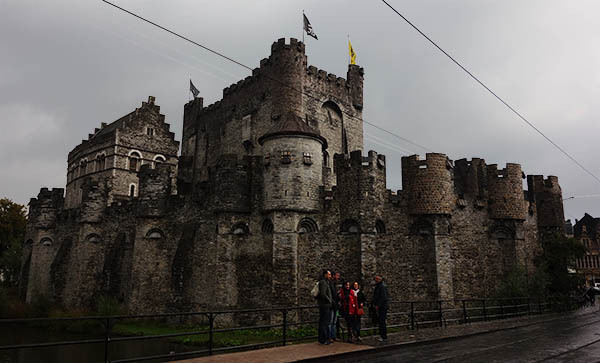 This castle, called Gravensteen, dates back to the twelfth century, but it fell out of use during the industrial revolution and was in the process of being converted into other buildings when it was saved as a historical landmark – but it was already in deep ruin; the restoration process was intensive. I got tickets and took a self-guided tour, and it feels a bit like a Disneyland castle. There was a weapons exhibit complete with guillotine, and it’s tough to tell what’s original and what’s not. The view, at least, is great. But I think I would have been better served going to the top of the cathedral. I was staying at an AirBnB location run by two gay guys, and I talked with them a bit. Like most of the other AirBnBs, they had something like 4 steep stories. They lived on two, rented one on AirBnB and rented out two tiny apartments to college students. I never saw the college students. It was interesting talking to the hosts, though. They were watching a soccer game on my first night, a world cup preliminary. Belgium is one of those world-cup teams with a ton of huge names, that just doesn’t gel. 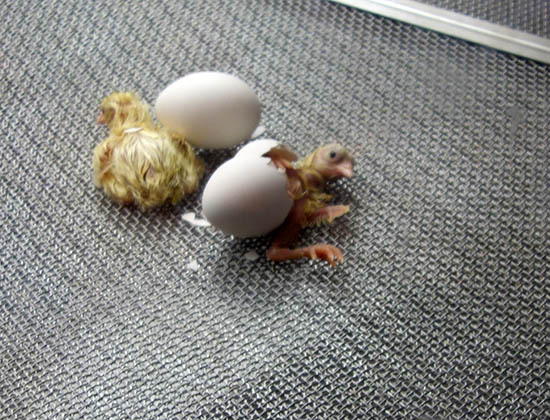 They outperform their population and underperform expectations, if that makes any sense. We also talked a bit about the divide in Belgium. As you may or may not know, there’s no real reason for Belgium to exist as a country. IT sort of fell together. It’s divided into two sections, a Flemish-speaking Northern portion and a French-speaking southern portion, and there’s separatists. It’s a bit like the US, the southern portion is more rural and there’s ill-will that they’re dragging down the richer urban north. The Flemish speakers want to do their own thing. Aside from all the cathedrals and boats and beautiful streets (and a few hours where I was violently ill), my most enduring memory of Belgium is when I knocked on the door of the main floor living area and opened it to find these two guys sitting together right by the door, on a little couch, looking utterly content. This entry was posted in Europe 2013 on July 30, 2015 by rob. From Iceland, I flew into Brussels. 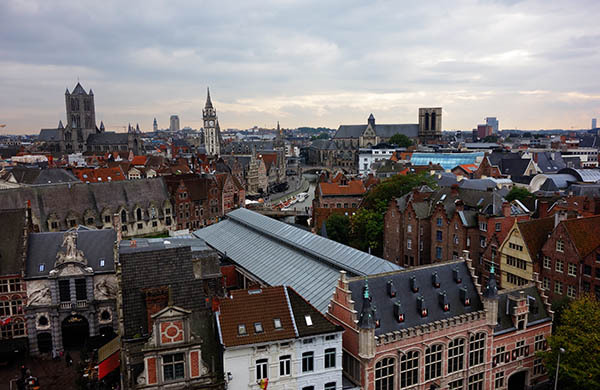 You couldn’t call it a city that I wanted to visit: it was the cheapest place to fly, and I thought I’d spend a few days because it’s the center of the EU, and so on, before moving on to Ghent. 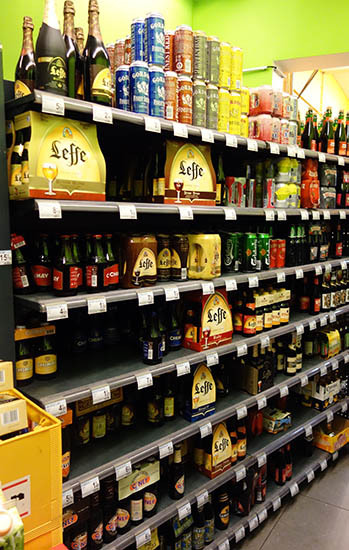 This being Belgium, the first thing I wanted was to grab a beer. 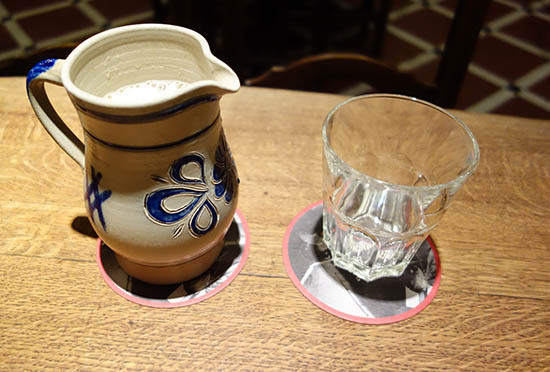 There’s a lot of unique styles of beer in Belgium, notable Gueuze(a really distinctive bitter lambic… I didn’t like it), Kriek (a cherry beer brewed with Belgian yeast, which I loved), and then the Trappist beers, like Chimay. Luckily, I found the bar. All the bars I visited in central Brussels were really fancy. Either with a Victorian feel, or a more down-to-earth wooden charm. 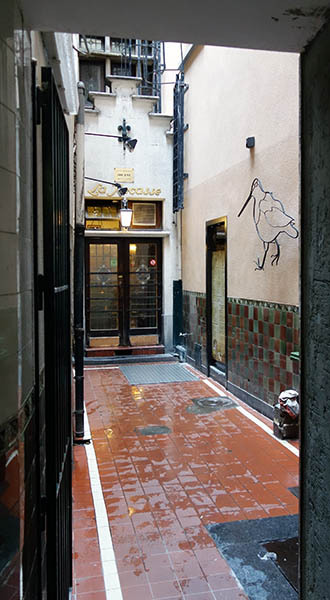 This place was called A La Becasse, they brewed their own beer. It was mostly empty when I visited and I just relaxed and planned my visit. 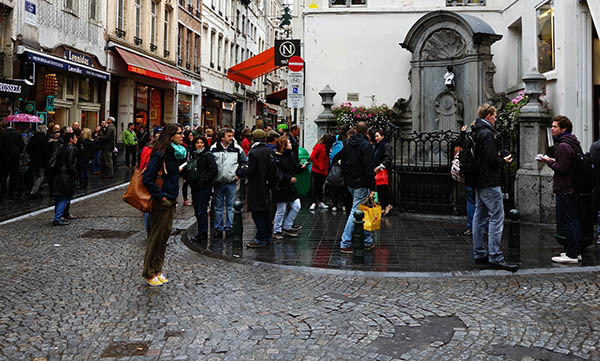 I walked through the main tourist district, which is relatively small, to see the Manneken Pis, a tiny statue of a boy urinating in a fountain. It’s supposed to convey how ‘cheeky’ the Belgians are. People from around the world send him costumes and he gets dressed up. Apparently there’s a museum that shows these costumes (no, I didn’t visit). 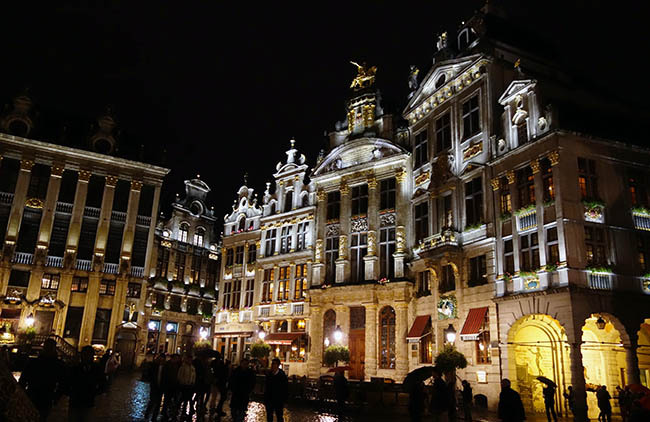 I kinda liked Brussels, but it’s a tough city to love. 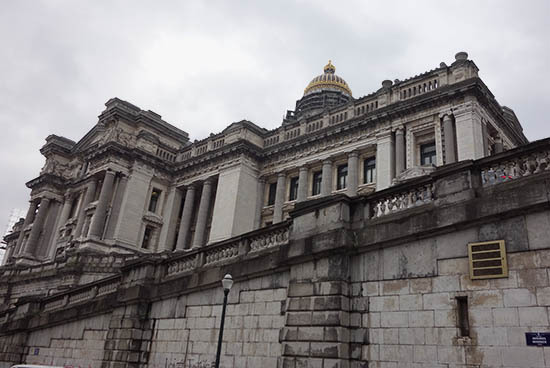 There’s a lot of government buildings, for both the EU and Belgium, and there’s no unified style like I’d see out in the smaller cities. Medieval cities next to huge classical-style ministries of Justice. You can’t get your hands on what the country means… just like it’s tough to get a grasp on Belgium as a whole, a country divided between two languages, a tiny peaceful little place that owned of the most horrific colonies in Africa, the Belgian Congo. 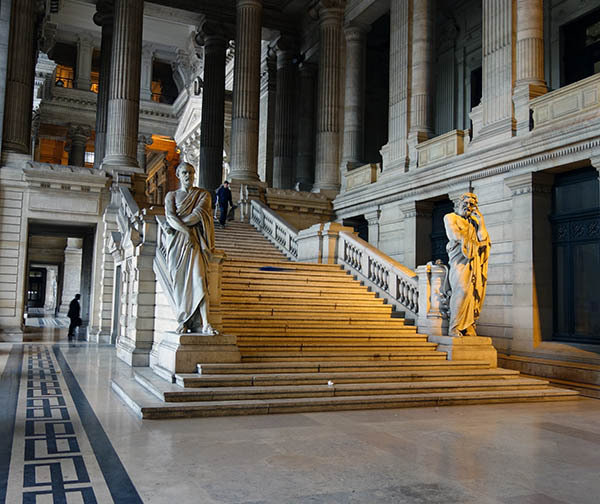 I visited the Palace of Justice, a huge imposing building that the Belgians I talked to intensely disliked. It’s huge and dour, like something out of 1984. 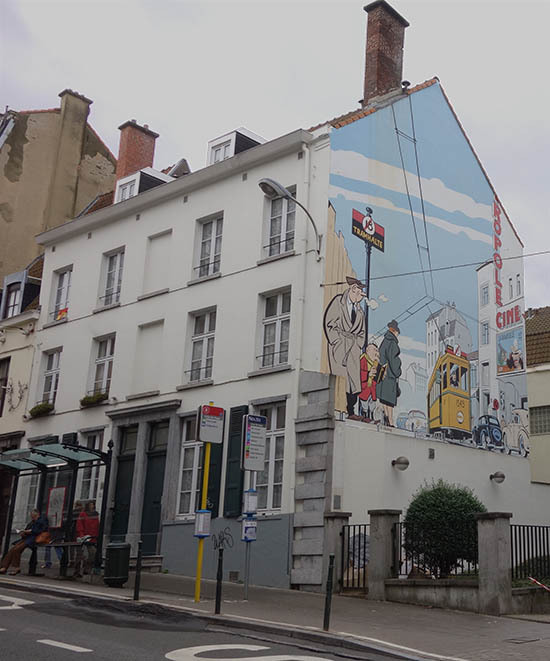 Located outside the city center, as you walk back, there are charming murals from the famous Belgian comic book artists (Hergé, author of Tintin, was Belgian, and culturally the country still appreciates comic books). 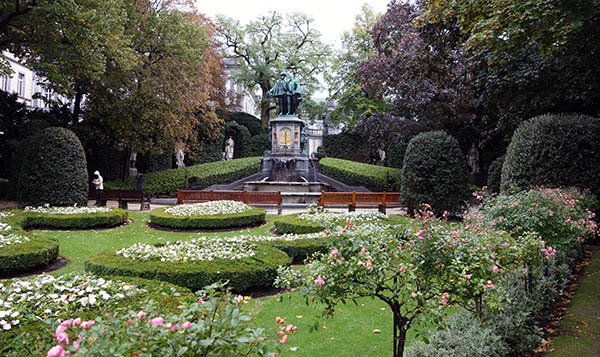 There’s a lot of random history in Brussels, as you might expect. It has the oldest shopping malls in the world. 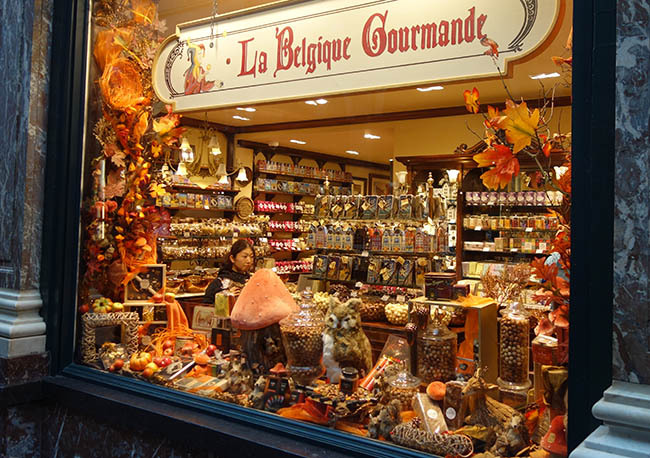 Fancy chocolate store in one of the oldest shopping malls in the world. 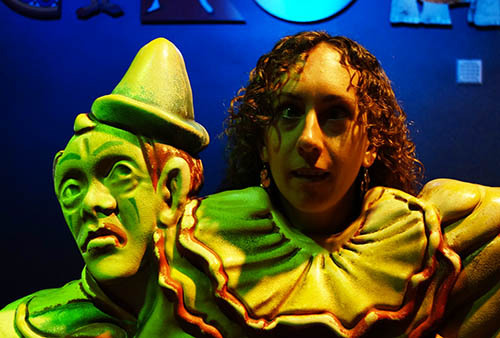 As well as artisinal chocolate, crazy artwork, and a mishmash of cultures. Standard beer selection in a 7-11 type convenience store! Chimay, Leffe, Hoegarten, etc! That night I stayed at an AirBnB spot – an enormous three-story building in a more diverse neighborhood outside the city center, surrounded by tons of halal vendors, cricket matches, and Pakistani food. 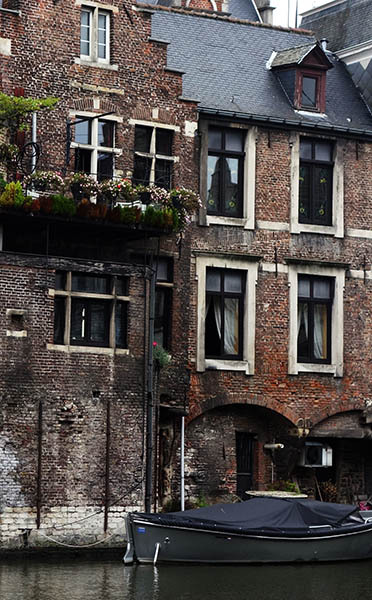 It was their (a small family with a toddler) first time hosting someone from AirBnB; the ceilings in all the Belgian homes I stayed in were super-high, while the apartments were narrow and the walls rich mahogony. 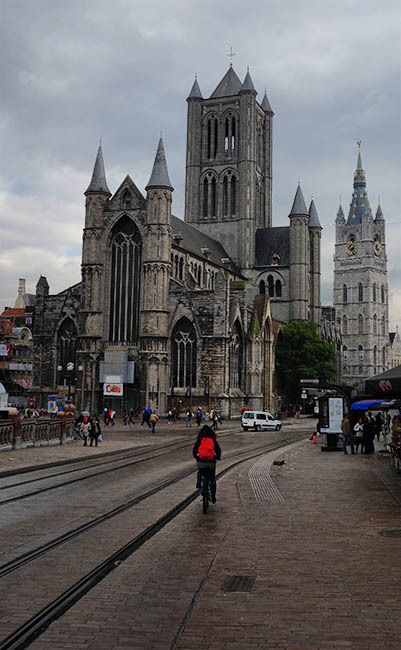 My next stop was Ghent (then: Antwerp and Bruges), as I zig-zagged my way across the country. This entry was posted in Europe 2013 on July 25, 2015 by rob. Following my cross-country camping trip, I wanted to make a quick international trip before returning to work – in this case, a week and a half in Europe, traveling to Iceland and Belgium. After spending roughly a week at home in Jersey City, I would head out to Iceland on October 10th, as an extended layover prior to visiting Belgium. I first visited Iceland the previous year, but had spent the entire time within Reykjavik. A cute little city, to be sure, but as anyone who’s seen photos of Iceland knows, it’s the countryside that surpasses other countries in its austere beauty: its waterfalls and glaciers, the volcanoes and icy beaches and hot springs, in the land of the Huldufólk. 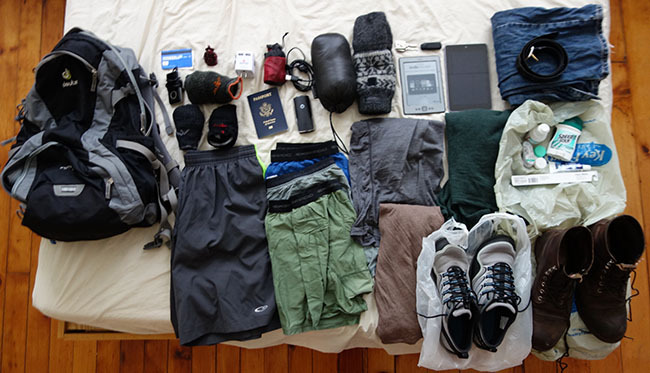 My packing list: 3 pairs wool socks; 3 pairs synthetic underwear; mp3 player; batter pack; USB cables; mini-daypack; universal AC adapter; wallet; passport; compressible down coat; wool mittens; wool t-shirt; cotton t-shirt; running shorts; ultralight shoes; wool sweatshirt; boots; jeans; toiletries; jeans; belt; Kindle; Nexus tablet; camera. Of these I never used the ultalight shoes (I had hoped to train for a marathon that I would run a few weeks after returning, but found myself distracted, and didn’t really want to run in unfamiliar cities). 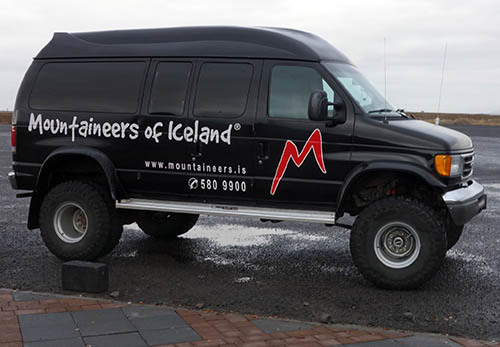 There are a few ways to tour the Icelandic countryside: you can do a quick bus trip, rent a car, or go on a four-wheel drive expedition. Many of the roads on the country’s interior are deep gravel and only suitable for four-wheel drive vehicles. I wanted the autonomy to travel at my own pace, so I opted for the car rental. 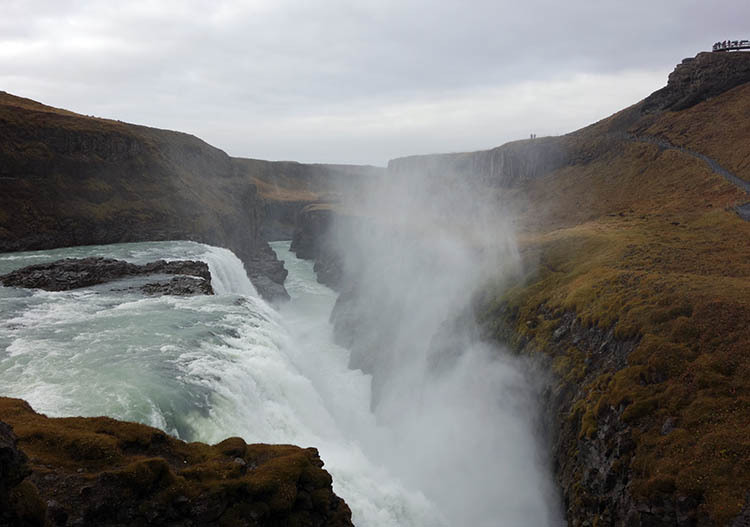 I also stopped at Gullfoss, Europe’s largest waterfall, most famous as the site of opening of Prometheus. 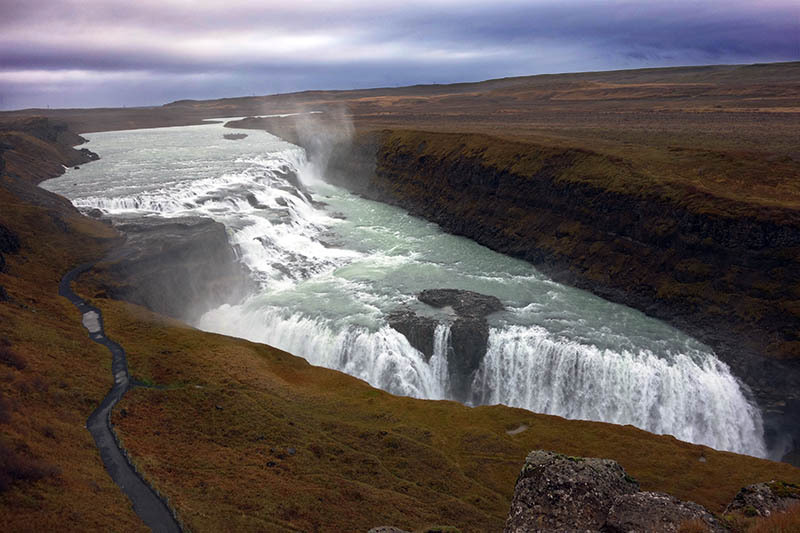 The landscape surrounding Gullfoss is completely flat, so the river and the waterfall seem to appear out of nowhere; the waterfall is visible only from a narrow vantage point. Gullfoss is also the end of the line, where the pavement ends and turns into gravel – posted signs make it clear that only four-wheel drive vehicles are allowed. 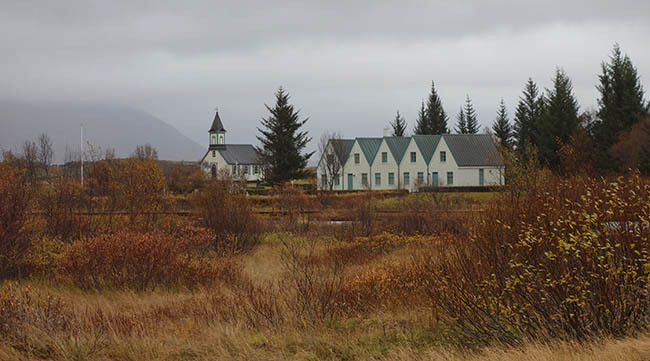 I hoped to check out Thingvellir, the original home of the Icelandic parliament – Europe’s oldest, dating from 930. 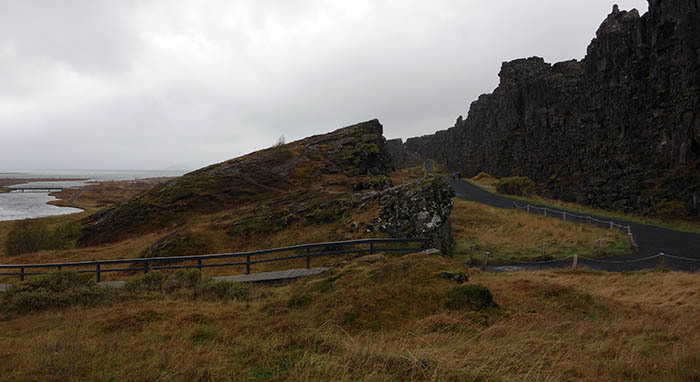 Really deep Viking territory; Thingvellir is also notable as the edge of a tectonic plate. 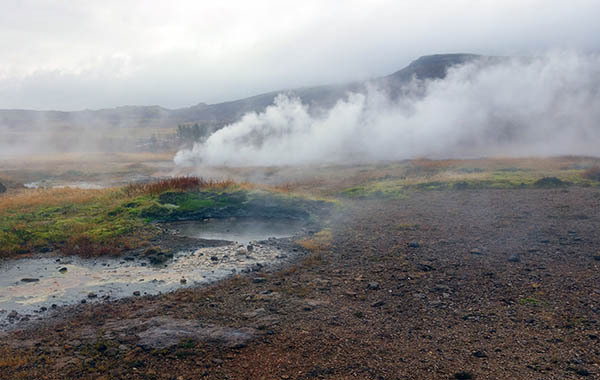 It’s jarring in a way that’s similar to Gullfoss: a huge shelf of igneous rock right in the middle of two grassy plains. I stopped at a youth hostel in the middle of nowhere (literally, the middle of nowhere – it was more isolated than Kansas. There was a little swingset out front with two kids playing on it, and I was the only guest… it was far outside the summer tourist season, or even the winter aurora borealis season. I snacked on food from the local grocery store and read about Belgium. The next day, I only had two stops: I wanted to travel along the coast, and I wanted to visit the Blue Lagoon. 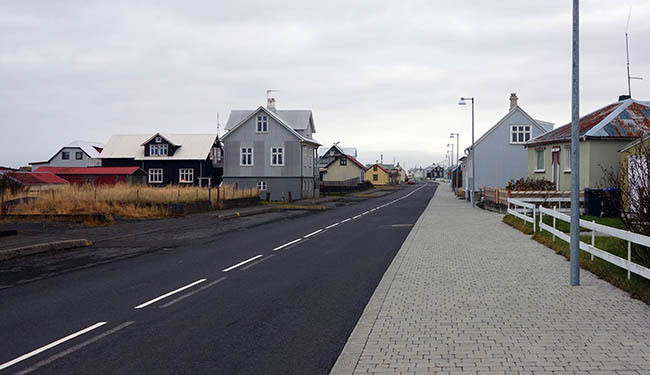 Traveling along the coast, the absolute emptiness of Iceland became readily apparent. Iceland has an area of 40k square miles. That’s roughly the size of Indiana. But its population is only 300k, of which 200k live in the Reykjavik area (Indiana has a population of 7 million). It’s possible to look at the entire country on Google maps, and see ‘major’ towns that have just 2700 residents. 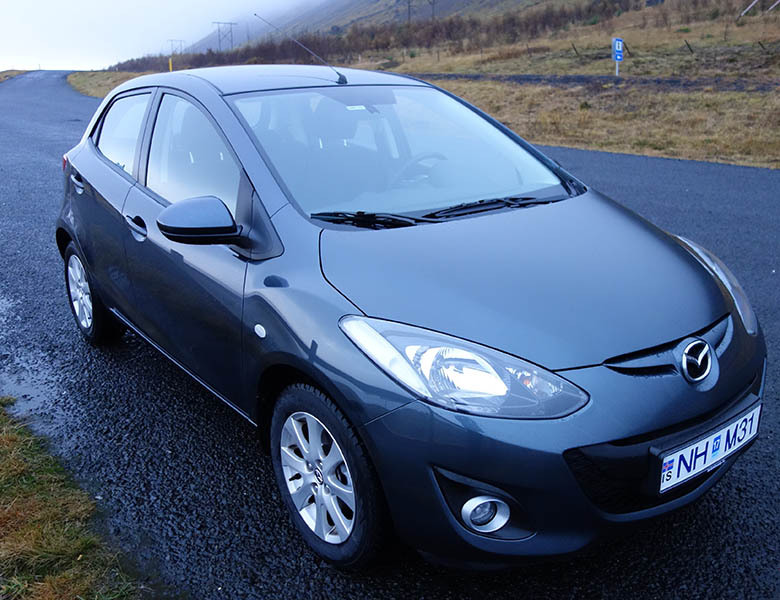 In my case, I stopped in Eyrarbakki, population 530, on the southern coast. It was mid-morning, but I didn’t see a soul as I walked the length of the town – really a one-street town. The ocean was right there, over some rocks, and the wind was chilly. The colorful little houses, so characteristic of Nordic architecture, were here revealed to be shabby – cozy and shabby; no industry was apparent. Wikipedia dryly notes: “The most recent enterprises in Eyrarbakki have been a fish-processing plant, and an aluminum frying-pan plant. However, the main fish factory closed in the 1990s, and the frying-pan factory has closed as well.” Now it’s the site of Iceland’s largest prison, a facility that houses 87 prisoners, 63% of Iceland’s 140 prison cells (there are 12 cells for women in the country). I also stopped at Blue Lagoon, a famous spa in geological hot springs near Reykjavik. The water is opalescent blue, and the spa is a large single pool of geothermal water outside, surrounded by volcanic rocks; standing up in the water exposes you to some bracing winds. (It’s striking, but they don’t allow photos in the spa). 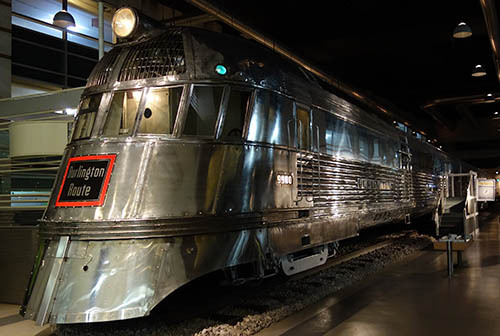 I enjoyed the visit as a one-time treat, but it’s quite pricey and I don’t think I’d return. 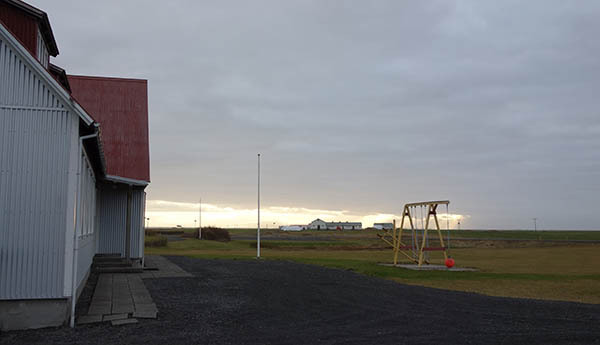 I spent the night near Reykjavik, to be ready for an early-morning flight to Brussels, Belgium. This entry was posted in Europe 2013 on July 21, 2015 by rob. 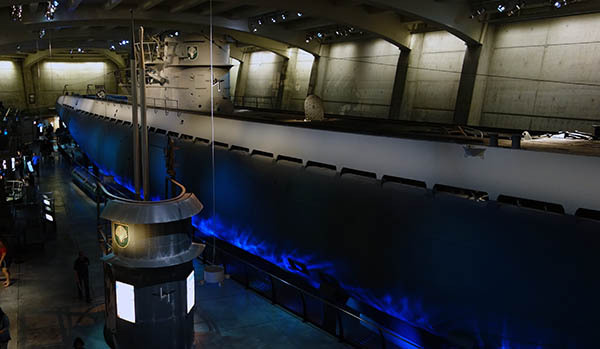 We had big plans for our third day in Chicago, Memorial Day Monday, including a much-deferred boat cruise and a trip the renowned Chicago Museum of Science and Industry. 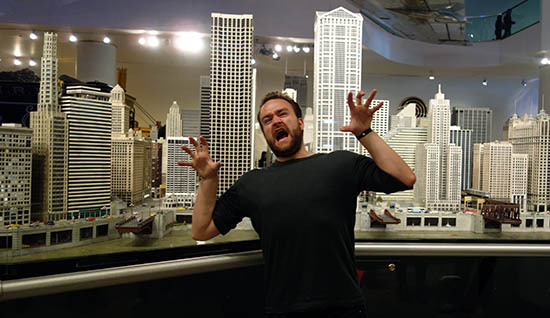 We’d gotten recommendations for this museum from a bunch of Chicago natives. Normally I’d be reticent to visit a science museum. Lots of trivial children’s toys, simple experiments, and so on. But it had such good recommendations (and it was totally worth it)! And caught a glimpse of Godzilla (or something near enough like it). 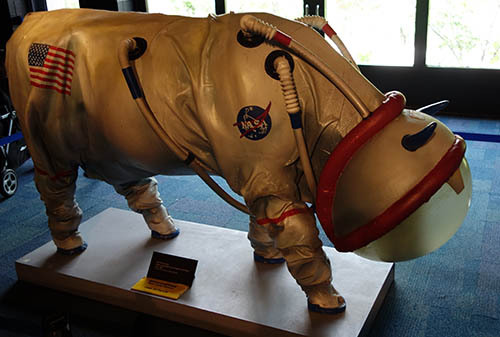 But for me, the highlight of the trip was seeing an actual Mercury spacecraft. One that had been in SPACE. This particular craft had an interesting story. 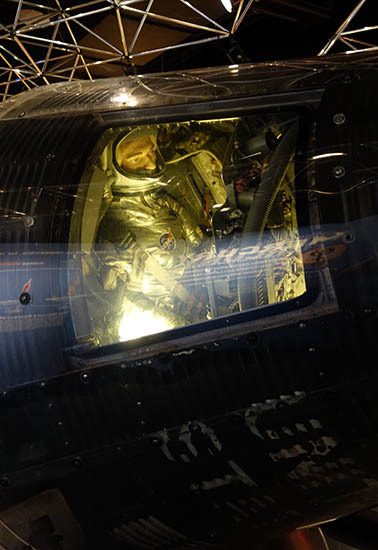 It was piloted by Scott Carpenter, who saw the same “fireflies” as John Glenn, and was able to identify them as ice particles released off the spacecraft (he hit the wall of the spacecraft with his hand and knocked some loose). Nonetheless, he was distracted and as a result splashed down 250 miles off from where he should have; he never returned to space. But, he did became an aquanaut (! ), and worked on Sealab. 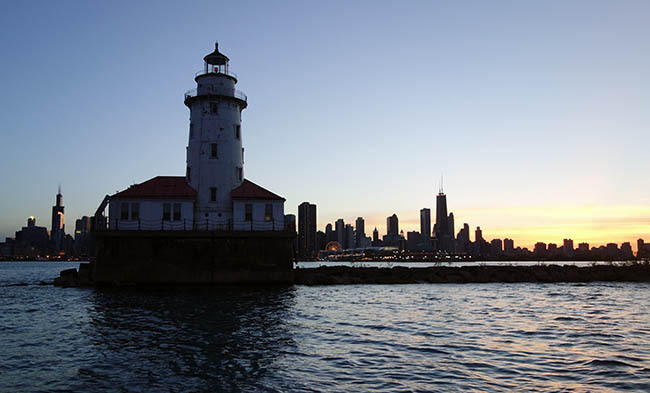 After a full day in the Science museum, we got a few drinks, and then went on a boat cruise – there’s a number of them in Chicago and this one went along the river and then way out on the lake. 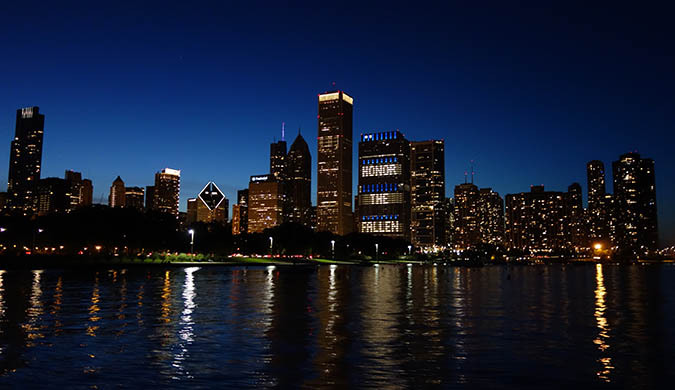 It was a perfect night, warm, clear, not too hot, and the views were great. When we headed out, there was still a lot of light, but we got to see the sun set while still out on the water, and then saw the city at night. We also swung in close, and got a look over Millenium Park. After getting off the cruise, we headed back to our apartment for an early night. 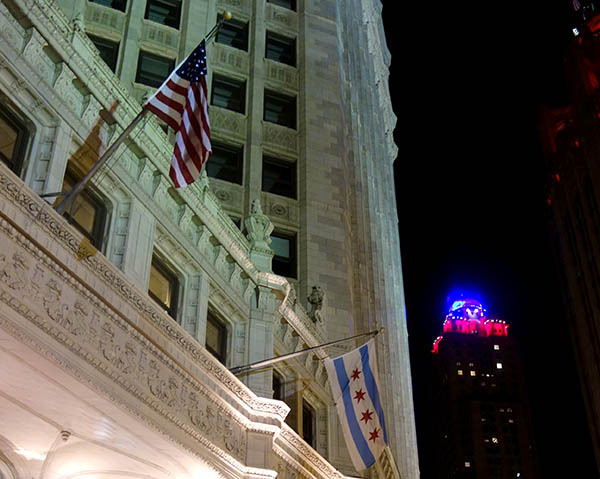 (The Chicago city flag is amazing and everywhere, and here’s a great TED talk about city flags in general, because they’re so interesting). 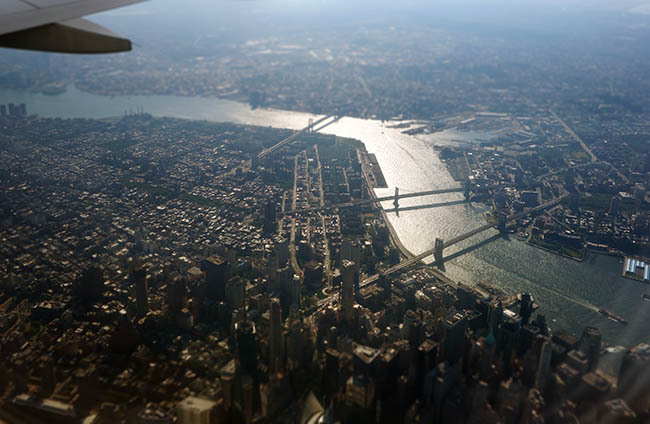 We flew back to NYC early on Monday, before the work day, and got a great view of the city before touching down and returning to the daily grind. This entry was posted in Uncategorized on July 20, 2015 by rob.